A fresh look at making sense of our daily life and work in God. A fresh look at making sense of God in our daily work. A fresh look at making sense of God's call on our lives. A fresh look at engaging with the world as 'the church'. A fresh look at issues and challenges in daily life. Find out how you can set up a new group or use an existing group in your church or workplace to explore ways to connect faith with daily work and life. Facilitation skills enable groups to learn effectively together by respecting and building on experience and enabling everyone to contribute effectively. Explore some useful tips about facilitation. 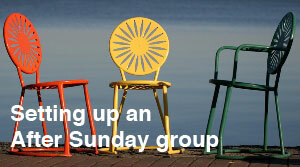 By registering with After Sunday, you will help us to know how, where and when the Resource Catalogue is being used. This will help us develop our resources for the future. If you are willing for us to contact you after you have downloaded the materials, we would be very grateful for feedback from both the facilitator and the group members. Please register here or follow the link in the top right of the page.